It is sad and embarrassing, and it's also very ignorant and pathetic. Sadly, racist chants, jeers, and noises such as monkey noises have been spewed forth from the terraces and stands at football matches in Europe and other parts of the world for way too long. 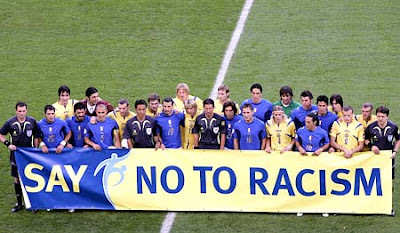 In 2006, FIFA was finally moved to start its "Say No to Racism" marketing campaign, but it still seems too early to tell if that marketing campaign has had any impact. In this modern era of social media when some players are now more accessible then ever, at least in the digital communication sense, it's disappointing, but not that surprising, that some ignorant morons are using the technology to send their hate directly to players like Edu. Edu, being a gentleman, hasn't divulged the Twitter names of these people, cause if he had, I'd publish them here. While we cannot specifically call out the idiots that have harassed Edu, those of us who love the Beautiful Game and attend matches on a regular basis can call out and humiliate anyone who makes a racist chant or jeer in our presence. Do not be afraid to publicly shame such people - after all, they are obviously not afraid to act like an idiot in public. Last season after a Dynamo - DC United match, a fan yelled racist insults at United goalkeeper Louis Crayton. Houston fans in the area pointed the offender out to security and he was duly taken away and banned from attending Dynamo matches. In the days following the incident, one poster on Big Soccer stated that while not condoning what was said, other fans should not have pointed the offender out to the authorities. This "no snitching" attitude is just as bad as the racism and echoes the stupid mentality of Firms and Ultras in Europe, especially in Italy where opposing Ultras will team up to fight the police. Trust me, you are not a snitch for calling out racism, you're a good human being. I confront bigots. And I make no apologies for it. 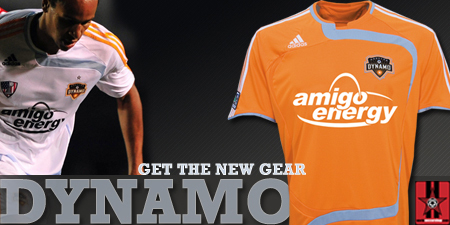 Is Landin Joining the Houston Dynamo?